I am currently reading Sum: Forty Tales from the Afterlives by David Eagleman, a very clever book that creates 40 vignettes --most are just a few pages -- of the afterlife, each uniquely provocative and a little creepy (but in a good way of course). How he thought up each of these 40 tales is beyond me. So you wait in this lobby until the third death. There are long tables with coffee, tea, and cookies; you can help yourself. There are people here from all around the world, and with a little effort you can strike up convivial small talk. Just be aware that your conversation may be interrupted at any moment by the Callers, who broadcast your new friend's name to indicate that there will never again be another remembrance of him by anyone on the Earth. You friend slumps, face like a shattered and reglued plate, saddened even thought the Callers tell him kindly that he's off to a better place. Not everyone is sad when the Callers enter the room and shout out the next list of names. On the contrary, some people beg and plead, prostrating themselves at the Callers' feet. These are generally the folks who have been here a long time, too long, especially those who are remembered for unfair reasons. For example, take the farmer ove rthere, who drowned in a small river two hundred years ago. Now his farm is the site of a small college, and the tour guides each week tell his story. So he's stuck and he's miserable. The more his story his told, the more the details drift. He is utterly alienated from his name; it is no longer identical with him but continues to bind. I think it is fair to say that Princess Diana will be waiting for her third death for quite some time. Today marks the 12th anniversary of her tragic death right here in Paris. She actually died on the night of August 30 but the accident occurred around 12:23a, just minutes after her car departed from the Ritz Hotel, and she was declared dead around 4a. Full details on the accident can be read here. The path of the vehicle is shown in the map below. 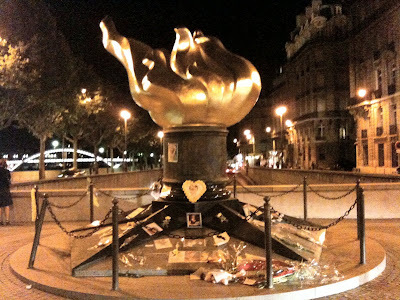 The marker in the upper left hand corner is the location of Dodi Fayed's apartment, which is where they were apparently heading when they left the Ritz Hotel from the less conspicuos back entrance (see marker to the right), but instead of turning right at Champs Elysees in the Place de la Concorde, the driver Jean-Paul continued to the Cours La Reine along the Seine River. Perhaps he intended to circle back to the apartment after eluding the paparazzi. The Eiffel Tower is in the bottom left hand corner where the Google logo is. In any case, he was driving too fast, especially since the road both turns to the left slightly and dips just as you enter the tunnel, which goes under the start of the Pont de l'Alma on the right bank, just a few hundred yards from the Eiffel Tower across the river. The result was a catastrophic accident that killed 3 people, including Diana. I decided to visit what has become an unofficial memorial to Diana -- The Flame of Liberty -- which is situated on the end of the bridge above the tunnel in which her car crashed. (The tunnel itself is not accessible by pedestrians.) It is a 3.5 meter high, full-sized, gold-leaf-covered, replica of the flame at the upper end of the torch carried in the hand of the Statue of Liberty and was donated to Paris in 1989, well before Diana's death. I left about 9:30p tonight, hopped on the RER B at Port Royal, switched to RER C at St-Michel Notre-Dame station and got off a the Pont de l'Alma station which is actually on the opposite side of the bridge from the memorial. After walking across the bridge, I set up my tripod, attached my camera, got everything in position and ..... the battery for my camera was dead. No, this cannot be happening. So, I have for you, not a 10 megapixel, time-lapsed picture with my professional Nikon D-80 camera, but a pathetic iPhone pic to remember Diana's 12th death anniversary. 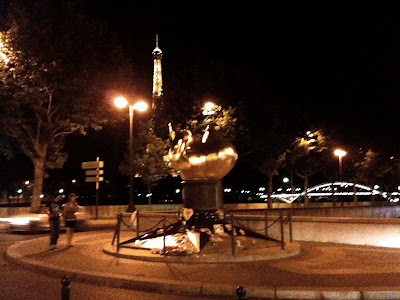 Actually, two iPhone pics -- one of just the flame and the other with the Eiffel Tower in the background. As it turns out there was no big crowd. Don't know if there was any official -- or unofficial -- ceremony earlier in the day there. Groups of two or three kept straggling by, spaced just perfectly enough apart to require me to wait some 15 minutes before I could get a picture without visitors in the way. But I waited patiently, still in disbelief that my camera battery was dead becuase I had left the camera on the last time I used it. After taking the pictures, I looked over a few of the tokens of remembrance, which included pictures, flowers, and notes. It actually was not as packed as I expected. And then I left. I retraced my RER rides and was home by 11p. Oh, and I am charging my camera battery. I won't make the mistake again. In the meantime, Diana will, whether she like it or not, probably be waiting a long time before here name is never mentioned again.